Scarlet is such a vibrant, passionate, colour, that even a little bit of scarlet in a photo will make it stand out. 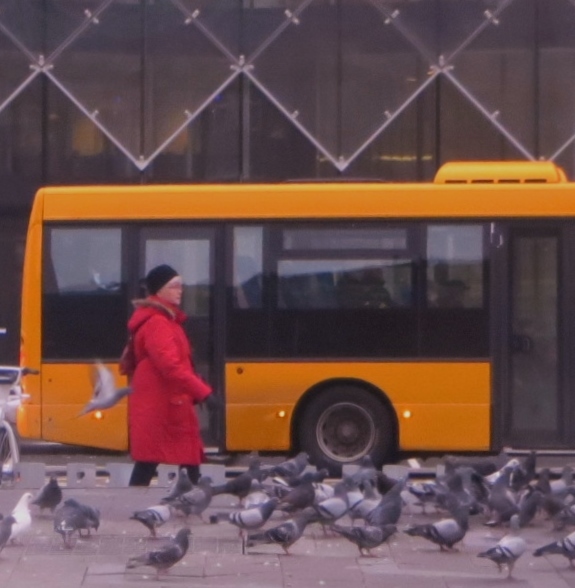 My first photo was taken in Copenhagen last winter, and the Lady in Red really stands out against the yellow bus, even though the pigeons in the foreground seem to be ignoring her! And from winter to summer, my next shot was taken on a summer holiday in Italy, and the pops of red, scarlet and orange really bring life to the scene. 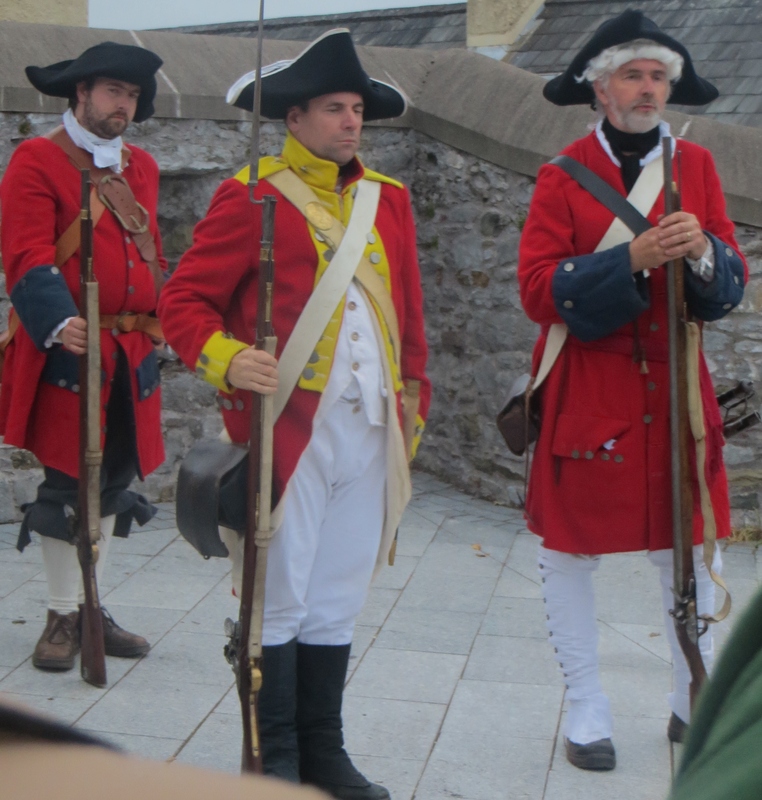 In the 17th and 18th centuries, soldiers’ uniforms were often scarlet in colour, as you can see from these re-enactors demonstrating the various types of uniforms used by British armies in days gone by. Thanks to Jennifer for her prompt. Most people are sociable, and like to meet up with friends for a drink, a meal, a coffee, a good cu p of tea, and of course a good natter with our friends. 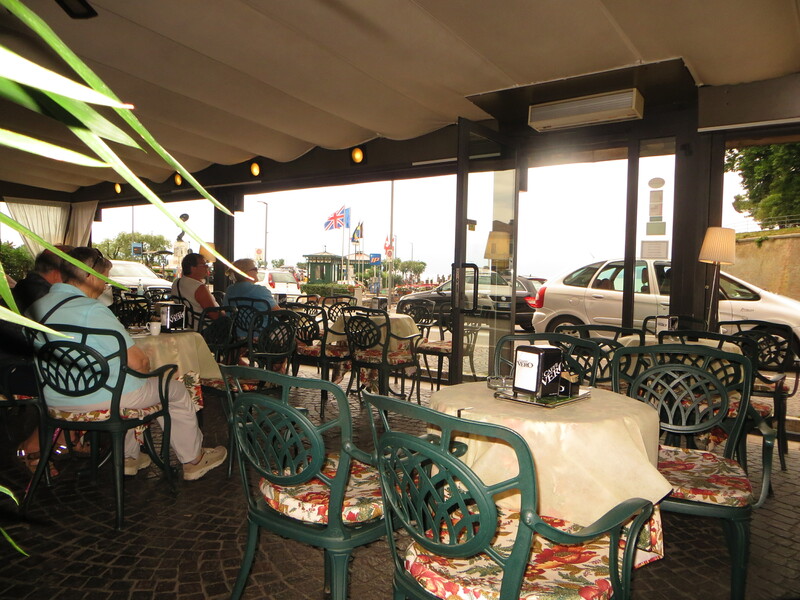 Here is one such place, where you can sit and watch the world go by, while enjoying a nice Italian coffee (with or without alcohol)! 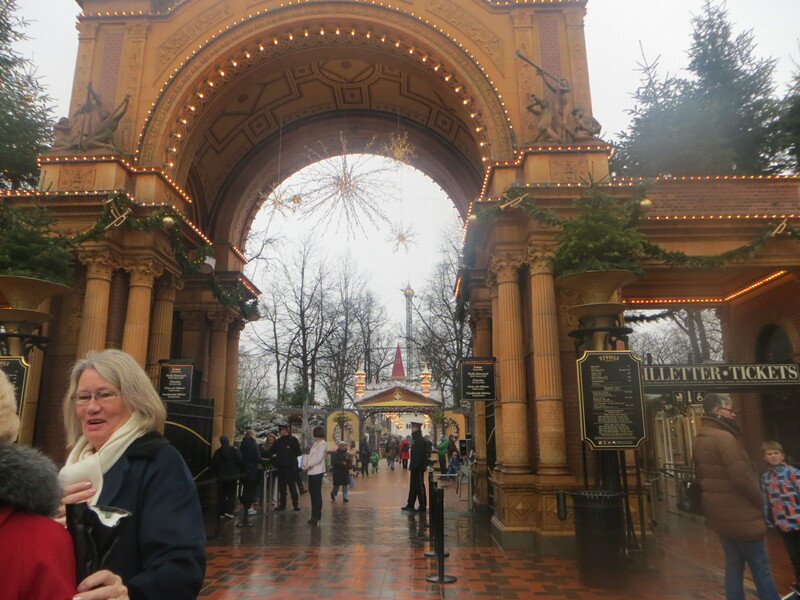 The entrance to Tivoli Gardens in Copenhagen is a great landmark for people to meet up and enjoy the great gardens, all year round. 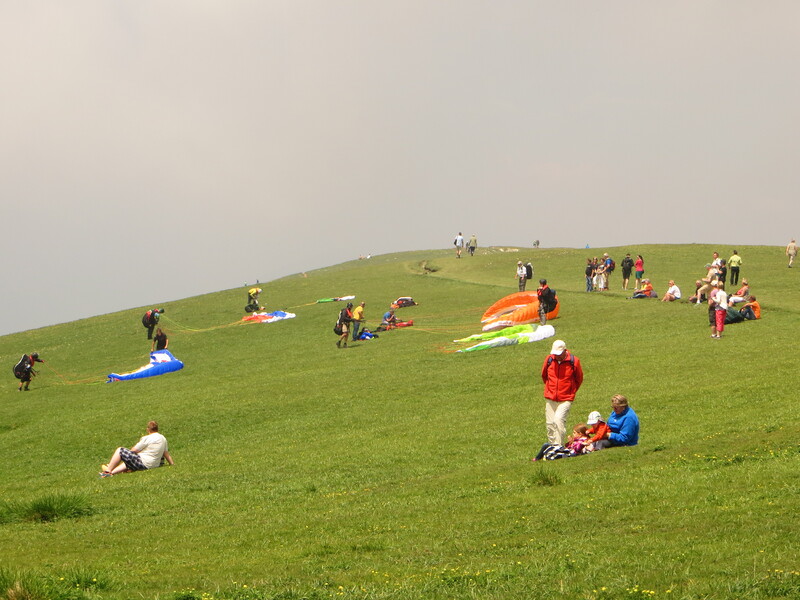 Or you could take the cable car to the top of Mount Baldo, and meet up with the many young people getting ready to take a quicker route down the mountain. 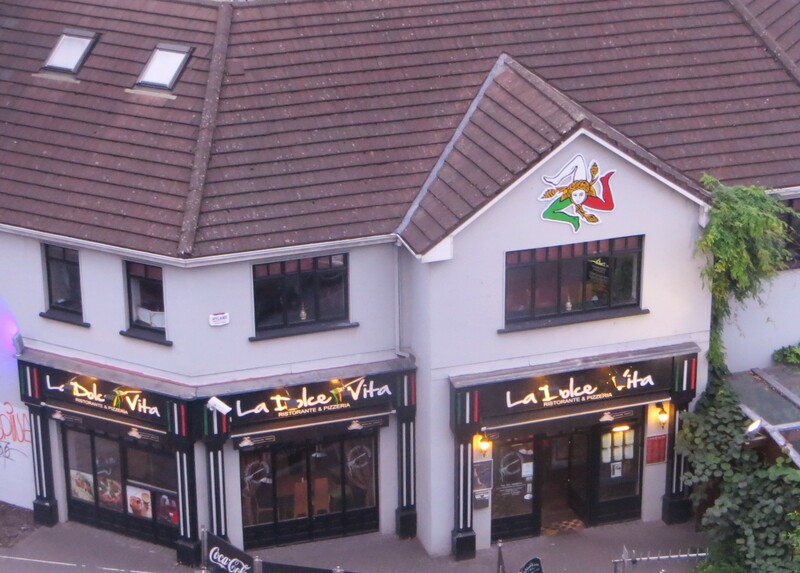 Time for some Italian Food – Pizza or Pasta? Dawn from The Day After has given us a challenge this month to post some architectural buildings, here are a few of mine. Head on over to Dawn’s blog to see some more. I love the challenges that Cee puts up each week, they are always fun, and different. Everywhere we go, we come across man made items that are very beautiful, sometimes almost as spectacular as natural wonders. Think of the 7 Man Made Wonders of the World : the Giza pyramids of Egypt, the Great Wall of China, Taj Mahal in India, the Machu Picchu in Peru, the Colosseum in Rome, and Petra in Ordam. Others are the Chichen Itza in Mexico and the statue of Christ the Redeemer in Brazil. Though I haven’t seen any of the man made wonders mentioned above, (except in photographs), here are a few very nice man made items that I have come across on my travels. 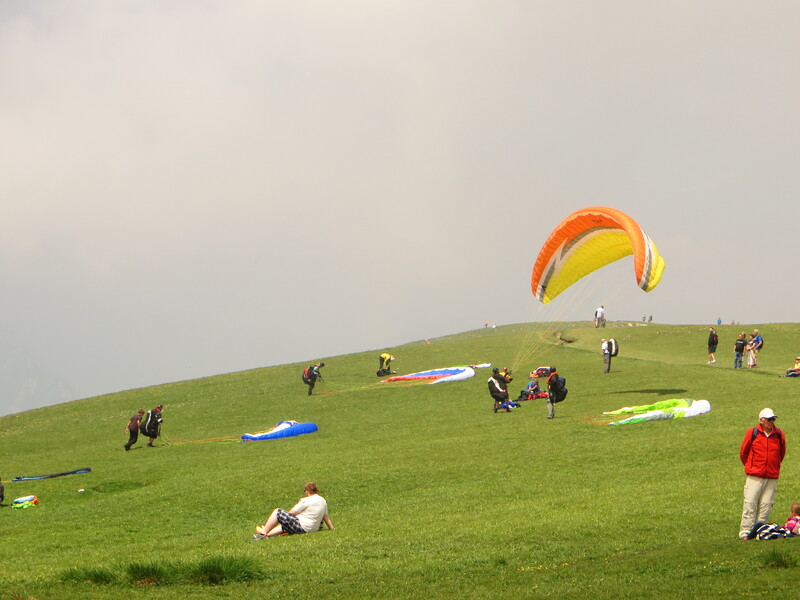 We are a community, we fly, we swoop, we flutter, we glide, through the traffic and over the heads of the people walking around the square, almost touching but not quite. we pick up the scraps, we spot them with our eagle eyes…and some people even come especially to feed us, bringing us old scraps of bread and seeds in their shopping bags. Even if the humans don’t feed us, they throw away their fast food cartons and rubbish, still with some food left inside, and we are happy and full by the end of the day. We are city birds, we perch on window ledges and roofs, unlike our cousins who like to live by the sea and perch on clifftops. But no matter where we are, we stick together and look out for each other, just like a good community.